Who better to make your tropical cocktails this summer than the globetrotting daughter of a lobsterman with a passion for mixology? 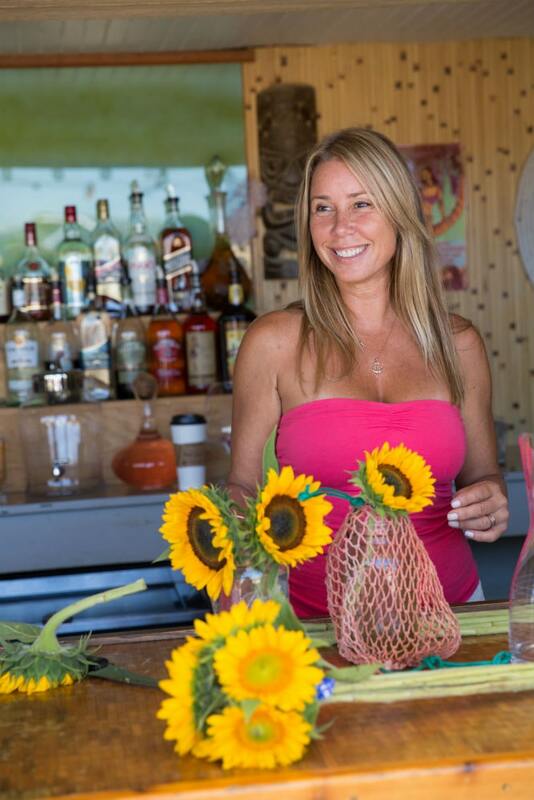 Enter Lynn Calvo and her Hula Hut, Montauk’s best-kept secret. Lynn has a passion for entertaining, design, music and of course cocktails, all of which is evident in her Instagram worthy Hula Hut nestled right in Montauk. The relaxed island vibe of the bar is perfect for hot summer nights, and Lynn’s organic cocktail program is second to none. We sat down with Lynn to discuss favorite cocktails, entertaining and all things summer. So happy it’s finally summer! What are you most excited about this season in the Hamptons? LYNN CALVO: I guess I’m most excited all of the cocktail events that will be hosting! LC: There is never a dull moment in the hospitality industry, especially in the Hamptons. You never know who will show up at Lynn’s Hula Hut. I love my clientele, it’s very diverse from local fishermen to international guests. They all share one thing in common -when they are at the Hula Hut they are all happy! Where do you get inspiration for your cocktails? LC: Most of my inspiration for our cocktail menu stems from the fact that I travel so much, so they are all globally inspired. I also get my inspiration from the local farmers market. Why do you put such an emphasis on organic, fresh ingredients? LC: I was raised in a family where nothing ever came out of a can. We mostly eat from my grandmothers garden. So it’s important to me to always eat fresh & clean food, which is exactly the way I like to drink - clean cocktails. What tips do you have for people making cocktails at home? LC: The one tip I could give people entertaining at home is to prep your purées for your cocktails and syrups just before your guests arrive, so you can enjoy your time with them. Have all your shakers and glasses ready to roll. Perhaps have a picture or infusion ready to go. My cocktail book, “Tiki with a twist” will definitely inspire you. Also, great music is a must. Most importantly, what cocktail will you be drinking all summer long?! LC: I love clean drinks, therefore, I love a really good tequila on the rocks with fresh lime and also the gluten free Hukilau vodka with lemongrass and ginger which is one of our top sellers. It’s so fresh and clean, it’s basically summer in a glass. Share details on your local music programming? LC: In season we feature local and traveling singer-songwriters on the tequila stage from 5pm. They’re all very talented as I’m extremely selective as to who I invite to the stage. What else can't people miss this summer? LC: Lynn’s Hula Hut & Goldbergs famous bagels....is the Breakfast of Champions!! Every Saturday and Sunday in July and August we host an epic Bloody Mary bar where guests can get creative together 11-2pm. Fresh Bagels & a variety of hot sauces, picketed okra, Cajun green beans, shrimp, etc. We have this Beautiful & Bohemian shaded outdoor room called The Zen Den with daybeds and is available for private events. Perfect for a weekend blood mary and bagel.